The Dictionary tab of the Configure Auto-Complete dialog can be used to view or edit the Auto-Complete master word list. Initially, the dialog will be displayed with an empty list. Use the Show option at the lower right to select the starting letter of the words you would like to view. 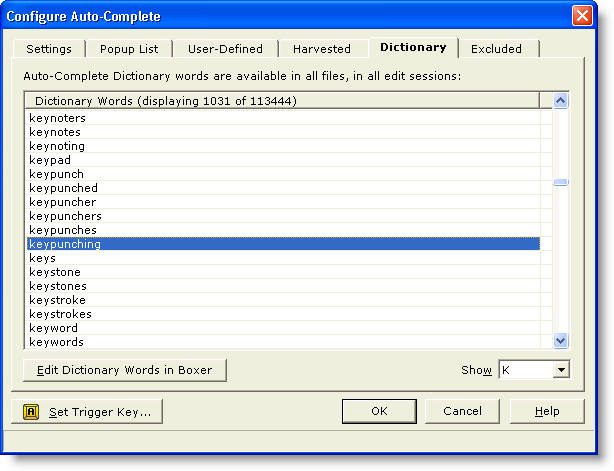 Click this button to load the dictionary word list into Boxer for viewing or editing. The word list is maintain in a simple ASCII text file, so it can be edited directly without complication. You can add new words, or remove existing words. The format of the dictionary file is straightforward: one word per line, alphabetically sorted, case insensitive. You can use the Sort Lines command, if needed to sort the file after additions have been made. Dictionaries for other languages are not available at this time, but if you can locate a large word list for the language of interest, you can use that list to replace the AC_Words.txt file provided with Boxer.